The best meal I’ve ever made. It was a year and a half ago and looking back on it, it also marked a turning point in my life. My girlfriend at the time, and I were drifting apart and this meal marked the end of our time together as a couple. It was a fitting tribute in all of its little parts and beauty. It was both simple and complex and a lot of care went into making it. In the end though, the meal was consumed and done, no trace was left of it except pictures and memories. Given the perspective of time it was a glorious thing, I have made better dishes since, but I have never assembled a full meal that came together as well as that one. I had been reading about kaiseki menus at that time and a lot of my friends were going to Japan that year, so I thought, what the hell, let’s give this a go. I mapped out my menu, and went shopping. I found beautiful fish at Uwajimaya. I proceeded to cure the fish on sheets of kelp that I had rubbed with sake, letting the brine and naturally occurring MSG in the kelp be drawn into the flsh. I made two stocks, one a simple kombu, or kelp stock, and the other a dashi, where I added great mounds of katsuobushi, the shavings of dried bonito to kombu stock. This was to be the base for a lot of dishes that night so it was important for me to pay attention to it. I would end up simmering the vast majority of the dishes in one stock or another. Altogether there would be 12 courses that night. All of them would be pretty damn incredible if I say so myself. I poured myself into that meal, knowing on some sub-conscious level that this would be my legacy and farewell to our time together, that almost ten years would be drawing to a close soon. Some dishes would be so very simple, all about enjoying just the one thing for all that it could be. Other would be more about contrast or layered flavours. Overall six dishes really stood out. The first was a zaru soba. 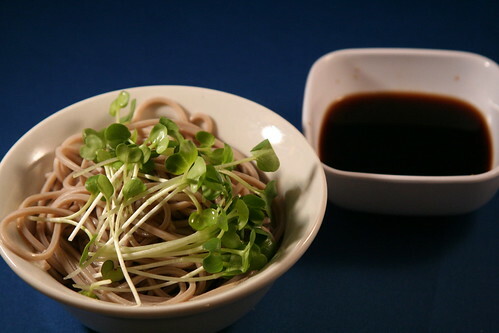 Cold buckwheat noodles in a dipping sauce that I made more citrusy than normal making it a nice wake up call for the taste buds to start the meal. The next dish to stand out was young bamboo simmered in dashi, paired with some kelp salad, and topped with a chilli aioli. 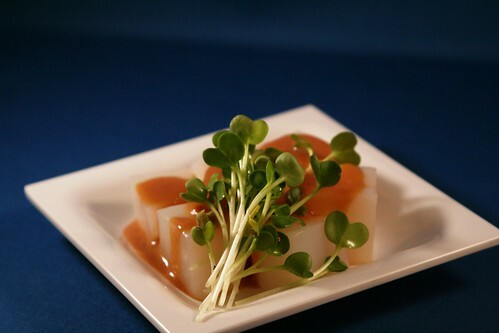 The bamboo was cooked just long enough to warm it through so that the crunch of the shoots could still come through. 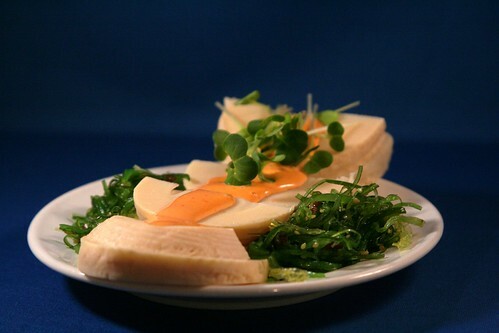 The salad made for a cooling sensation after the aioli brought a spike of heat. Konayku, a firm yam cake was also simmered in dashi. This one was simmered much longer so that the flavour of the stock could really infuse the cubes of konyaku. I served it up with a red miso based sauce. The saltiness and sweetness of the sauce added complexity to the dish. 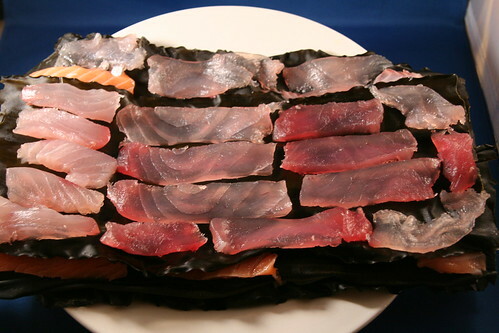 The fish I had cured on kombu came through even better than expected. 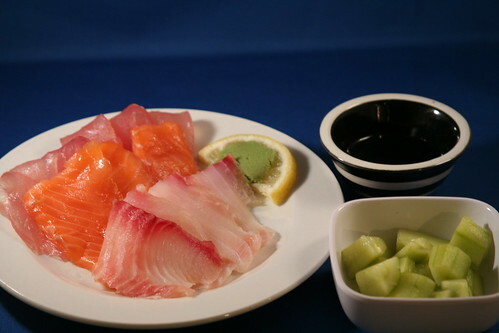 The salt and umami from the kelp added a dimension to the fish that surpassed and simply enhanced the fish itself. Paired with little pickles that I had started at the beginning of the meal, the crunch of the cucumber gave textural contrast to the firm flesh of the fish. A tataki of dry aged Kobe Beef was the penultimate course. 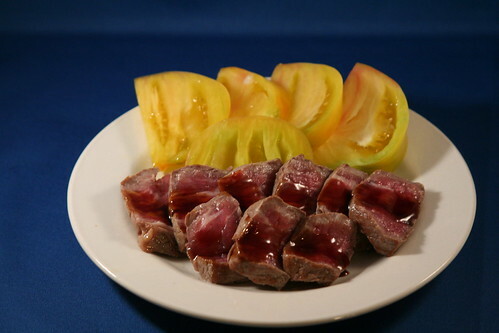 This was simply salted and seared, leaving the meat to give of all of its richness, and brushed with a bit of eel sauce to add sweetness to the beef. Taking a nod from occidental steakhouses (hee hee, I got to use occidental) some sliced yellow tomatoes were all that accompanied this dish. Hearty and rich, with the acid of the tomatoes giving balance and letting the tongue go back for more. I finished with an oden, a light brothy stew of daikon and fish cakes taking advantage of all the stock I had made that day to tie everything back together and to give the stomach a warming feeling to end it all. The meal was done, and so it turned out was our time together. Soon thereafter we went our separate ways, having grown apart, but I was then and am now glad to have been to give this one last gift. The best thing that ever happened to me and the best meal I have ever made. We’re still friends, and I still make some damn fine food. Someday, I will surpass that meal, and who knows going forward what the future holds. Do you have a meal that means a lot to you? What was the best meal you ever made?